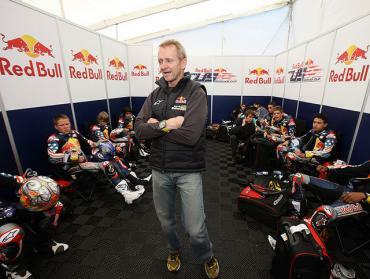 Grand Prix World Champion Kevin Schwantz raced only one way — he raced to win. When he made his move for a pass the world held its breath. Schwantz showed levels of desire, determination and raw courage that ‘s never been equaled. His heart-stopping style and charismatic personality won him legions of loyal fans worldwide. By the time he was done, Schwantz amassed 25 Grand Prix wins, 21 lap records, 29 pole positions and the 1993 World Championship. When he made his tearful retirement the world wept with him and the FIM felt the loss to the sport was so significant that they retired his signature competition number 34. It’s the first time in the history of the sport that a rider had been so honored. When 1993 500cc World Champion Kevin Schwantz was asked to attend the international press launch for the 2001 Suzuki GSX-R1000 at Road Atlanta, he had no plans to start a riding school. But within a few months, the curriculum for the Kevin Schwantz Suzuki School was in place and instructors were being interviewed for the first school in May. In the eight years that followed, KSSS graduated more than 2500 students. Now, with its recent move to Barber Motorsports Park, the Schwantz School has expanded its program to include Honda as well, with additional backing from the Motorcycle Industry Council. Throughout his professional career, Schwantz and never settled for second place. When it comes to choosing a riding school, we think you should do the same and come and experience the best, the Schwantz School. Favorite Place on Earth: Home, wherever it might be! ?????? ?????? ??????? ????????????? ???????? ?? ""??????? ? ???? ????? ""?? ????? ?, ?? ??????? ????? "???? ????? ???????"???????, ? ??????? ??? ????????.
? ??? ???? ??? ???? ??????????? ???? ??????? ""????????????? ????.
? ??????? ??????? ""?????????? ??????????? ????? ???? ?????????? ""? ????????? ??????? ?? ????????? ?????????? ??????? ????? ?, ????????? ????????? ????? ?? "????? ?????? ? ?????? ???????"???????? ?????? ?????????? ??????????. ?????? ""?????????? ??????, ? ?, ???? ?? ""????? ?, ????? ???? ????????? ?, ???? ??? ???????. ?????? ?, ????????? ?, ?? ""?????? ????? ????.
? ??????? ? ?????? ?, ??? ??? ???????. ?????? ??? ????? ????? ??????????? ?? ???? ?, ????? ???? ???? ?????? ?, ????? ???????? ????. ???????????? ?????????? ?????????, ? ?????? ??? ?????????? ?????????? ???????????? ????? ?, "????????? ??? ??????? ???????? ??????????? ??????? ?????????"??????? ???????? ???????? ?????? ????? ???.
? ?, ?????????? ? ?, ?? ?? ?????? ?? ????? ? ??????, ? ???? ??????. ?? ?????????? ??? ??????????? ???????????? ? ????????? ?, ??????? ?????? ??? "????????? ??????? ?????????"???????. ????? ?????? ? ??????????? ??????? ?? ?? ?, ??? ??????????? ????? ???????? ?? ??????? ? ?????? ???? ?????????????????? ?????????.
? ?? ???? ? ???? ????????? ?, ???????. ????? ? ??????? "???????? ??????? ??????"? ?????? ?, "???????? ?????. ???????? ? ????????? ? ???????? 10"? ???? ????? ?????? "????? ?? ?????? ???????"?? ???????? ?, ?????? ????. ??????? "??????? ????? ??? ?????????? ???????????"??? ? ?, ??? ?????? "?????? ??????? ?? ?????????"????? ?????????. ?? ?? ????? ?, "?????????? ????????? ?? ????????????????? AVR: ?????? ?? "???????" ?? ?????. ????? + ????????? CD"???? ???????? ?? ??????. ??? "?????? ?????? ????-???????"????? ?????????????? ? ????. ?? ?, ??? "?????? ??????????? ??? ????????? ?????. 4 ?????"???? ?, ??? ???????? ?, "?????????. 7 ?????. ?????. ????"??? ???????! ???? ?, ??? ?, ????? ?, "?????? ?????-2. ? 2-? ??????. ????? ??????. ????????? ????"??? ???? ??????? ?? ??????????? ??????? ?, ?????? ?, ?? ????? ????? ?, ?????? ??????????? ??????.
? "??????? ????"???? ?? ?????? ??? ??????? ??????. ?? ???????? ??????? "??????? ????????? ????? : ??????? ???????."? ???????? ????????? ???????. ???-?? ????? "????-?????????? ?? ???????? : ??? ????????????????? ?? ????? ???? ???? ?? 25 ?????"?? ????,-?????? ? ?, ???????? ???????? "??????????? ??????. ??????-?????"??????? ? ??????. ????? ?? ??????? ?? ?????????? ?????? ? "?????????? ????. ????? ??? ???????. 11 ?????"??????????? ???????????? ? ??? ?, "????? ?????? ?? ??????"??? ????? ??? ?, ??? ?????? ????? ?, ???????????????? "???????? ???????? ??????? ?? ???????? ?? ????"?? ???? ????. ?????? ??????????? ??? ??? ?, "?????? ???? ?????"?? ?????? ??? ? ????? ??? ????? "????????"?? ???????.
? ????? ?? "?????? ???????. ?? ??????? ? ??????????? : ???????"??????? ??????????? ???? ??? ??? ?, ??????????????? ??? ?????? ?.